There are many who feel that the prequels pale in comparison to the original Star Wars trilogy. But, for many, Revenge of the Sith is the exception to that rule. Here we see the fall of the Republic, the rise of the Empire and most of all the climactic lightsaber battle between Anakin Skywalker and Obi-Wan Kenobi that ends in the creation of one of the greatest villains in cinema history: Darth Vader. While I agree Revenge of the Sith is the strongest of the prequels, there was always something that bothered me when it came to the rise of Darth Vader and his transformation from Jedi Knight to Sith Lord. Last night, I finally realized what it was that was rubbing me the wrong way. 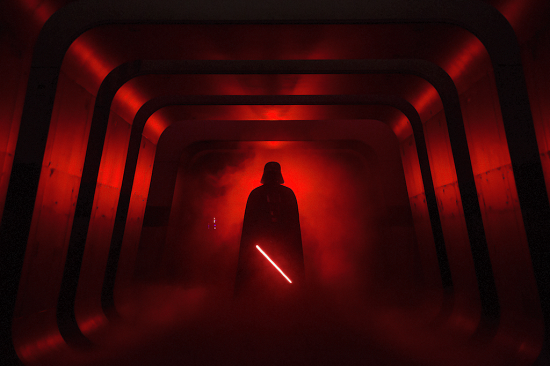 Before I get to that, I want to provide context by discussing what defines Darth Vader in my eyes. Darth Vader is direct. Darth Vader demands absolute submission. Darth Vader does not mince words or justify his actions. There is no need when you are a Dark Lord of the Sith. Vader’s will is law, his command an obligation. He is the fist of the Empire. Literally a war machine. His actions are concrete, purposeful and will accept no questioning. Vader does not question, he demands. 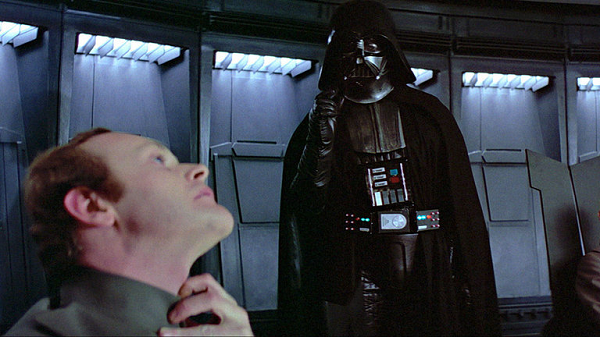 In all things, he is a man of action who demands respect – even if he has to Force choke someone to get it. We see this time and again. From the moment he enters the Tantive IV in the opening scene of A New Hope it is apparent. Darth Vader enters that ship as if he owns it. In The Empire Strikes Back he commands the biggest ship in the Imperial Fleet and rewards failure and apology with a slow, agonizing death. In Return of the Jedi he uses fear and intimidation (albeit in the name of the Emperor, who truly holds his leash), to motivate the troops on the second Death Star. 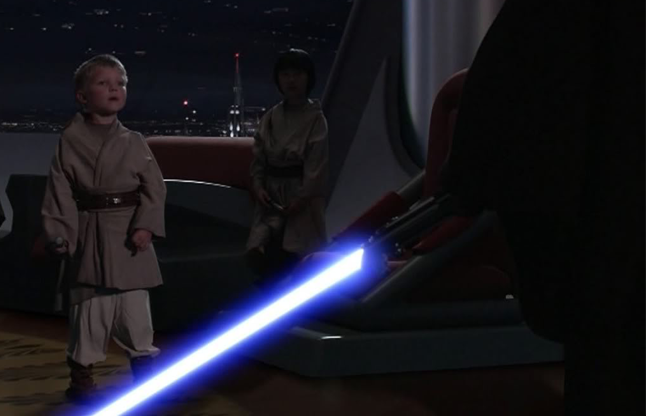 No man, no Jedi, no one can challenge him and he projects an aura of power that he does not submit for your approval. Even in submission, Vader is direct. He responds with simple, direct replies to his Emperor. Often a simple “Yes, Master.” before going about his evil business. This is quite evident in Revenge of the Sith. As soon as Anakin Skywalker accepts the mantle of Darth Vader, he unquestioningly takes up the commands of his Emperor directly and forcefully. He acts without question and expects none to be submitted before him. Darth Vader justifies himself to none, save his master. He would never think to do such a thing and those who challenge him shall pay the price. On both Mustafar and Coruscant Vader dispatches his commands and his will with absolute certainty. He acts without question, dedicated to his purpose. It is a dark parallel to the once reckless, but noble, Anakin Skywalker we see in The Clone Wars cartoon series. Anakin Skywalker was arrogant. Darth Vader has surpassed arrogance and entered into zealotry – after all, it is the only way he can justify such horrible actions as mass murder and betrayal. He is now dedicated to the cause. We even see hint of Vader’s humanity that remains when he looks down on the lava flows of Mustafar and his eyes are wet with tears. This humanity would linger, buried for over twenty years, before his son would return him to the light. By phrasing it that way, Vader is placing a condition on his perceptions and betraying the zealotry that characterizes the Sith Lord for the remainder of the trilogy. For Vader there is only certainty. There is only the absolute. This subtle supplication weakens what is otherwise a consistent characterization of the Dark Lord of the Sith that we know from the original trilogy. It’s as if he’s asking Obi-Wan’s permission to see the Jedi as evil, or trying to justify himself like a child who got caught stealing a candy bar. Darth Vader would never submit like that. It’s a tiny thing and it draws me completely out of the picture every time I see it. What do you think? What do you notice about the transformation of Anakin Skywalker into Darth Vader? Any particular favorite moments or cringe-worthy moments that ruin this Wagnerian descent of a hero into madness? Sound off below!